Over the past decade or so, there has seemingly been as much chance of seafarers drowning in paperwork than at sea. Each new set of rules has seemingly come with a load of administration to complete, logs, forms and checklists. 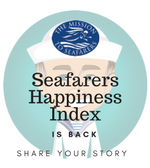 The seafarers who completed the Crewtoo Seafarers Happiness Index said they spend too much time on tasks they consider to be an administrative burden. This is something that has been borne out in other surveys – most noticeably by the Danish Maritime Authority, supported by InterManager, the international trade association for ship and crew managers. In their comprehensive survey of international seafarers, a third of all nationalities claimed that they are “annoyed or frustrated by administrative burdens in the maritime sector”. These burdens stem from what the seafarers consider to be unnecessary repetition of tasks and demands for too much paperwork and documentation to be handled. The study also concludes that there is a “significant potential to relocate time to more fruitful tasks” to increase efficiency and quality. The Danish study surveyed almost 2,000 anonymous seafarers from 59 different nationalities, and asked 55 questions to understand the burden and the different types of work-related activities perceived as administrative burdens among seafarers. Port and pre-arrival documentation proved particularly problematic with many seafarers feeling a lot of the paperwork was superfluous. Seafarers really are sick of paperwork, especially as in all too many cases the admin tasks take time away from more urgent and meaningful tasks in terms of guaranteeing ship safety. 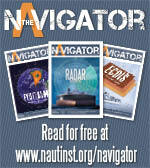 Seafarers want the rising tide of paper to be reduced. They want a lessening of the rigid control, and instead want to focus on culture and competencies in order to effectively and meaningfully improve efficiency and safety on vessels. The Danish report calls for the development of a, “work smart, easy-to-use” digital approach to reduce paperwork and time consuming manual workflows. This is particularly important in relation to port and pre-arrival procedures. In addition the report recommends a revived focus on seamanship and safety culture with a view to reducing the number of procedures and burdens. 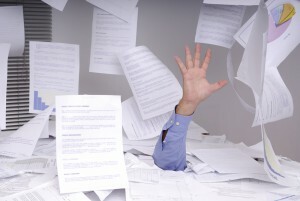 Paperwork doesn’t necessarily make anyone safer – and that is the point. It seems like an imposition without real reward. Even the most paper-centric of companies and administrations are beginning to see that there is room for sensible reductions in administrative burdens across the entire sector. Seafarers themselves – in their qualitative comments – often suggest easing rigid procedures and control systems somewhat and instead focus on culture and competences as a more effective and meaningful way to improve efficiency and safety on the vessels. 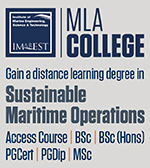 Even the International Maritime Organization (IMO), has entered the debate – and is seemingly committed to trying to reduce the burden on seafarers, and the seeming hunger of companies and those ashore to receive a constant reassurance that paperwork is proving what is happening at sea. The so called “backside covering” approach to management. The IMO has announced various plans to reduce unnecessary paperwork in the shipping industry. The first step has been to review the administrative requirements contained in IMO instruments and purge those that have become ‘unnecessary, disproportionate or even obsolete’. WHAT CAN WE IMPROVE AND HOW? Paperwork isn’t solely a maritime issue or problem – but it just seems that employees ashore have more time, and can put the light off and get on with it tomorrow instead. Seafarers often do not have that luxury. The research suggests that ashore business owners would like to spend more time on business development – as opposed to general administration and book-keeping. However, there is an impression that some shipping companies like paperwork –it gives them a sense of control, accountability and a means of reassuring charterers, clients and regulators. We have fallen into a paper trap, and we have to find alternatives – running a ship is not an easy process and owners are often under pressure to be more agile and do more with less. So you might think that finding better ways of dealing with information and checks would be popular. Stop and recognise the problems: Owners need to listen to staff, they need to think about what they are gaining in the paperwork and of the challenges that it poses to seafarers. Research and evaluate alternatives: “We have always done it that way” – is all too often an answer, and it isn’t helpful. Owners should ask their seafarers and shore staff for ways of improving – or perhaps look to external assistance. Savings may not be readily obvious – but happy seafarers, people who are less likely to be fatigued or frustrated are a real bonus. Implement suitable solutions: Owners should not be afraid of investing in technology…or even extra people. Using the latest data gathering and reporting equipment can provide massive additional value across the business, so it could be that in tackling the paperwork issue, then other benefits emerge. Evaluate success and address further issues: Keep on checking, talking, listening and understanding what is done, how and why. By constantly looking to the best options, then seafarers’ lives will be improved and there will be safety and operational benefits too.